Only available to USA customers, warranty is only valid on Dunlop products that we sell in the USA. Analog Man carries the Dunlop Jimi Hendrix Fuzz Face Mini Distortion FFM3. Silicon transistors spec’d from a 1970 Fuzz Face, small pedalboard-friendly housing, Status LED, AC power jack & battery door. Hendrix was the master of fuzz, an artist with many subtle shadings at his command. His love affair with the legendary Fuzz Face pedal began in the early days of the Experience and continued to evolve throughout his brief but blazing career. The Dunlop Jimi Hendrix Fuzz Face is a meticulously faithful reproduction of the 1969-70 Dallas Arbiter Fuzz Face that Jimi used on classic albums like Band of Gypsys. Dunlop's engineering department examined hoards of vintage Fuzz Faces, honing in on a few units which possessed that unmistakable Jimi voodoo. 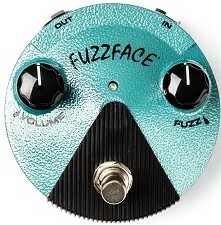 The Hendrix Fuzz Face is built around the toneful BC108 silicon transistor. It is authentic in every detail, a handwired brown circuit board with no solder mask and circuitry carefully matched to the original specs. The look is 100% accurate too, that groovy circular chassis with tooled clones of the original Fuzz Face knobs in the rare and vintage turquoise hammertone finish. The difference between this and the Silicon blue FFM1 is that the Hendrix has bigger capacitors for a deeper, less bright tone. Get yours today! Order now.